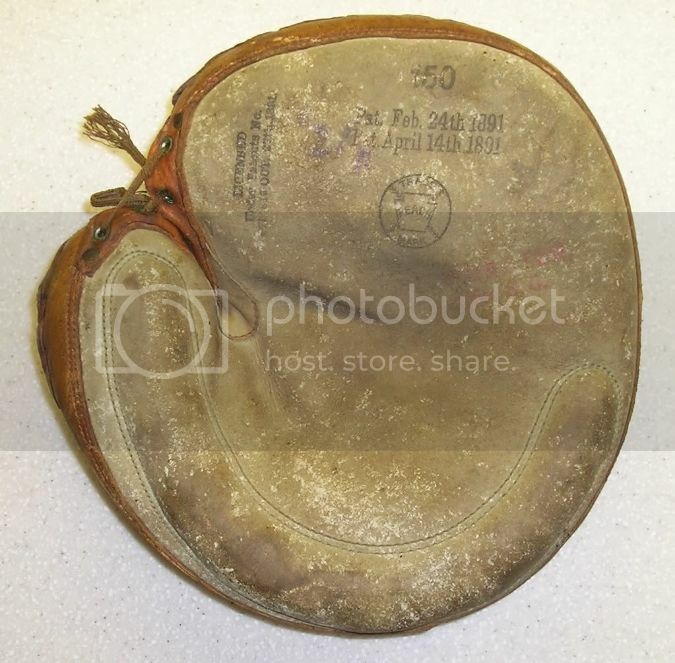 Vintage Baseball Glove Forum • View topic - A.J. 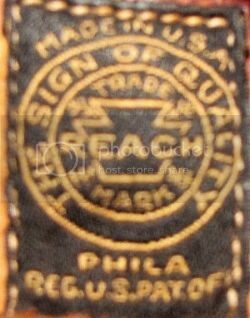 Reach Co.
Al Reach was born in England in 1840 and emigrated to the New York City with his parents. By the age of 16 he was working in an iron foundry and found the work to be brutal. His true passion was the after work baseball games at which he excelled. He played for the Brooklyn Eckfords as a lefty second baseman in addition to outfield positions. 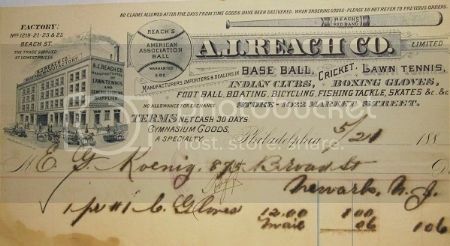 He was such an elite ball player that he attracted the notice of the Philadelphia Athletic Baseball Club in 1862 who offered him a $25 a week stipend to move there and play. It is written that he was the first paid professional ball player. 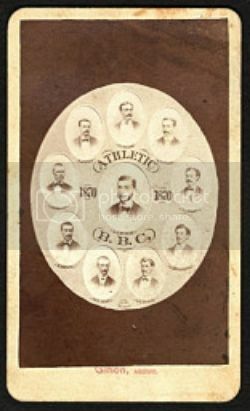 Below is a team photo of The Philadelphia ball club from 1870. Reach augmented his salary by opening a tobacco shop which he manned before and after ball games. The shop became a popular hang out for sportsmen and evolved into a sporting goods emporium by 1865. Below is an invoice from 1867 with a pretty cool letterhead logo. The invoice is to the Pythian Baseball Club for a dozen belts. Al Reach was quite the entrepreneur and businessman. By the time he retired in 1875 he made enough money to start his own baseball club, the Philadelphia Phillies. In 1882 He also formed a partnership with one of his sporting goods vendors, Ben Shibe and opened Reach & Shibe Co. which later was changed to A.J. Reach Co. 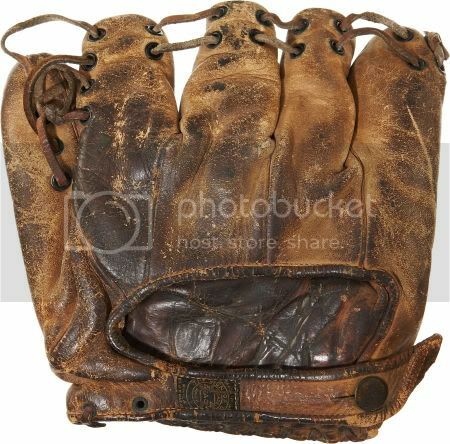 This early webless crescent glove is one of the finest known in the hobby. 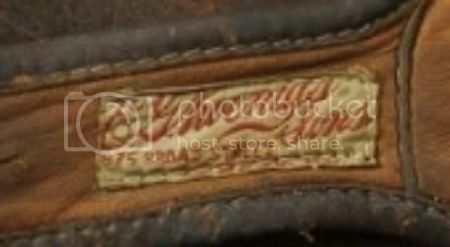 To have any manufacturers identification is a huge plus and this glove has a stunning cloth patch on the wrist strap. 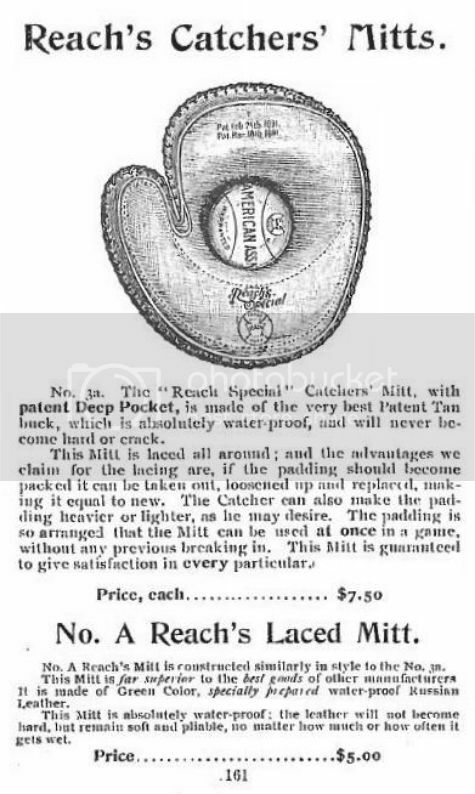 The Reach catchers mitt below is of the same era as the glove and has an interesting quirk regarding the patent stamping on the face. 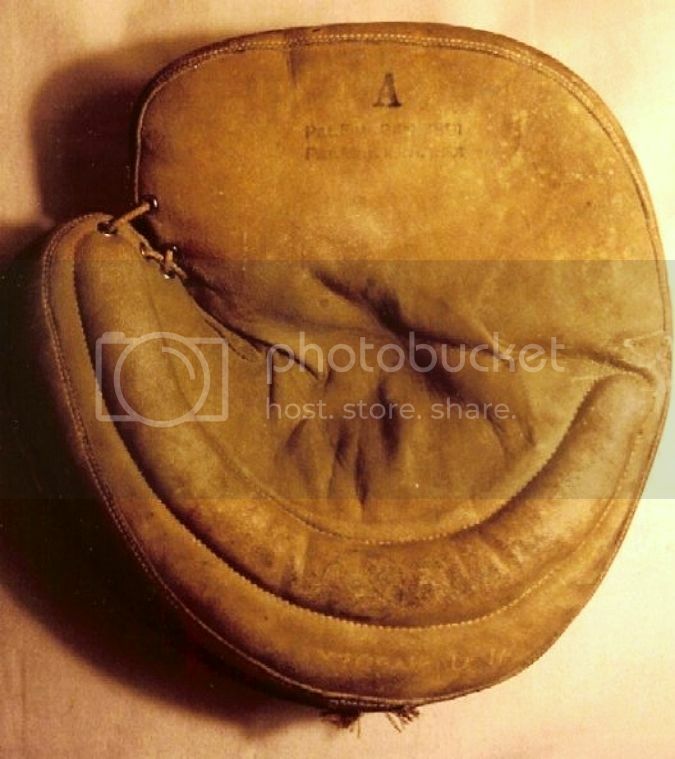 The first patent date on the mitt above is Feb. 24, 1891. It is for the perimeter lacing and the second date, Mar. 18, 1891 is for the arrangement of padding to form a pocket. Later mitts, post 1900 are stamped with a patent date of April 14, 1891 instead of the Mar. 18 date. The reach mitt below shows the change. 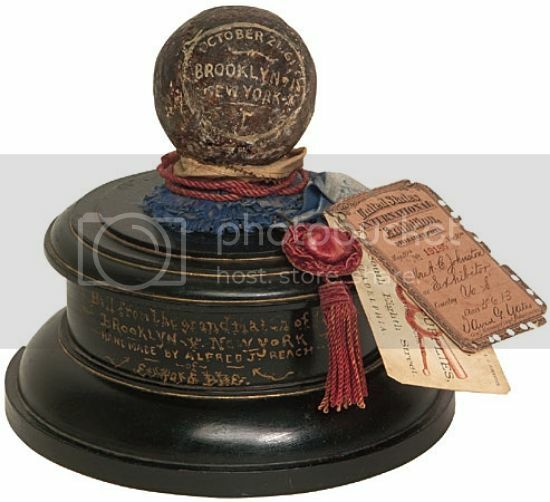 The book "Banana Bats and Ding Dong Balls" conjectures that the patent date discrepancy reflects the convoluted purchase of the patents by A.G. Spalding from famous but erratic ball player and inventor Harry Decker at a time when Spalding was also purchasing the A.J. Reach Co. There may have been intermediate assignors to Decker's patents reflecting different patent issuing dates. This A.J. 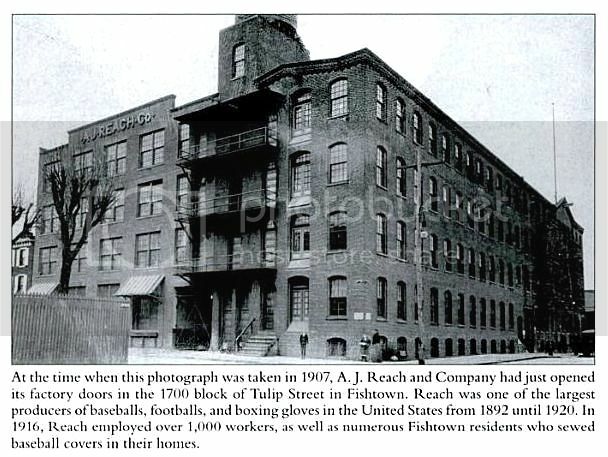 Reach factory circa 1907 takes up most of the 1700 block on Tulip St. in Philadelphia. Nice sign work on the facade. Even with this large facility, Reach was still outsourcing the stitching of some baseballs to the Fishtown neighborhood seamstresses. Here is the same factory view as of 2007. There was a permit issued for its demolition for condominiums. I don't know if it is still standing. I'm sure Murph has already made many a midnight raid with flashlight in hand in search of NOS gloves in the nooks and crannies. The A.J. Reach sign is missing from the facade of the building. Murph? A couple of Reach gloves recently at auction piqued my interest. The Max Bishop and George Earnshaw model gloves are uncatalogued but come with very ornate Art Deco boxes. I wonder if they were commemorative issues celebrating the 1929 & 1930 Philadelphia A's World Series wins. It would be interesting if there were other player commemorative models out there. There are way too many great examples out there in Reach hobby land for me to post. It would be great if you all could post your favorites. Great research as usual Mike. Thanks for spotlighting the A.J. Reach Company. Reach is by far my favorite glove manufacturer. Since I have a lot of favorite Reach gloves, I'll start out with my two different Al Reach endorsed models. 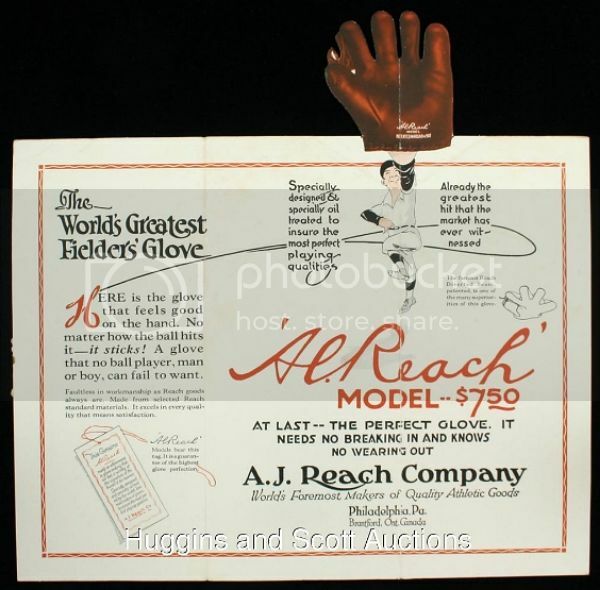 i always liked the "Al Reach" model with the grommet web but never lucky enough to own one. Here is a nice die cut ad for it. owner of the PHila As and the ball park where Philadlelphia(s) played for year: Shibe Park. Lot of baseball and baseball glove history linked into those names. "The Perfect Glove" . . .
After the Civil War, Ben Shibe worked for a company with his brothers making cricket balls. They soon left to form their own company, John D. Shibe Co. making baseballs. Shibe & Co. were vendors for A.J. Reach's sporting goods emporium in the 1860's. Ben Shibe and Al Reach became fast friends and their later partnership was a natural fit. Ben Shibe is credited with inventing ball assembly machinery that could produce a high quality and uniformly made baseball. They manufactured dozens of different balls with such catchy names as, Bounding Rock, Electric Ball, King of the Field, Out of Sight and many others. Dave Grob speculated that The Reach keystone logo came about because Pennsylvania is called the "Keystone" state. 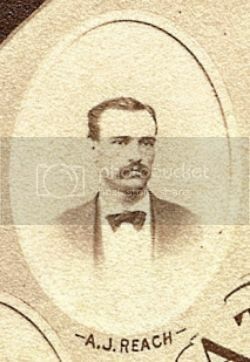 Al Reach's younger brother, Robert Reach played ball with the Philadelphia Keystone ball club circa 1860. That also could have had some influence. Last edited by mikesglove on April 13th, 2013, 12:40 pm, edited 1 time in total. 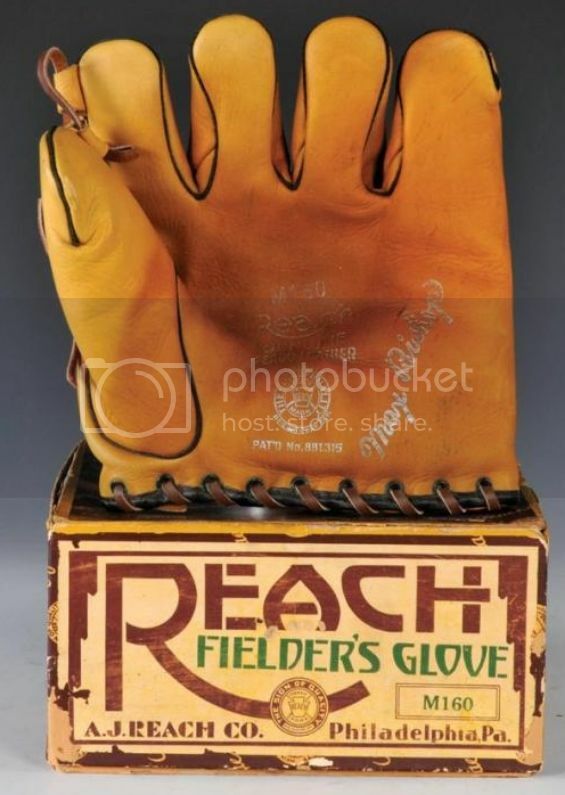 Nice job on the Reach history Mike and thanks for posting the glove and box combos. I have an M155 box but had never seen a glove with the matching model number. Those top line Al Reach gloves look great JD. Odd how many Reach sewn webs I've seen on ebay over the years compared to their later 20's and 30's gloves which seem to be much more scarce. 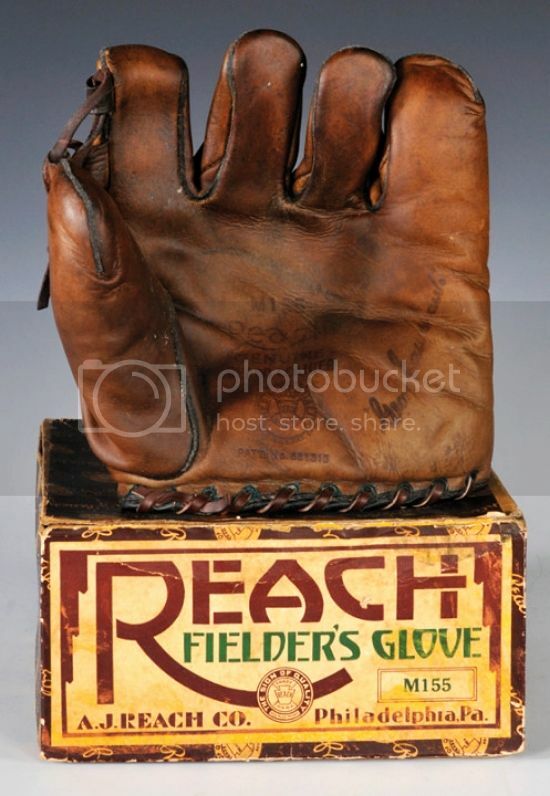 A Reach glove is at the center of my favorite unsolved glove mystery. 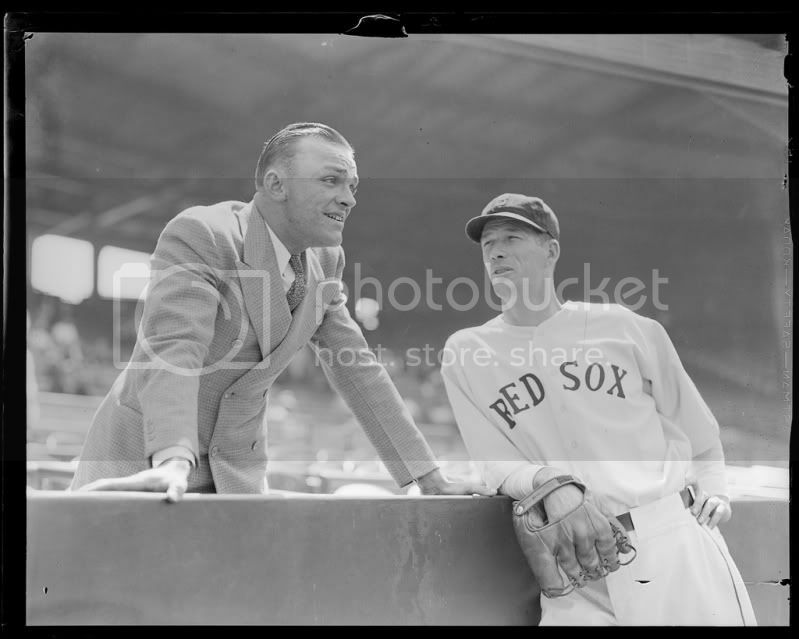 Was Lefty Grove's laced glove an actual production model or was it custom made for him? I've also seen pictures of Wes Ferrell with a similar one. Any opinions? E.G. Koenig & Sons were a large gun and sporting good store in Newark NJ. They were in operation from about 1880-1920. Pretty rare to find a glove from this regional supplier let alone one with a great cloth patch like this one from JD's collection. I have a "Bing" Miller glove. I've been trying for days to find something on it and I came upon your thread. Tried to post some pictures without success. In any case, if you click on the link below it will take you to a slideshow. If you can post the pictures here please feel free. Forgive the username. It's a long story and a joke. There is nothing "Nails" about me. My best move in a fight is talking the other guy out of it. My first post. Glad to meet y'all. You seem like a nice bunch of people. Special thanks to Brett for his patience with me (I was having a hard time getting registered). I personally do not collect baseball memorabilia but I love baseball (Go Jays!) and will more than likely put this up for sale. Problem is I have no idea of what it is worth. Anybody have a (sorry I have to do this) "ballpark" idea and/or where I can go to do some research? Thanks and as stated above, glad to make your acquaintance. Welcome and thanks for the pictures. 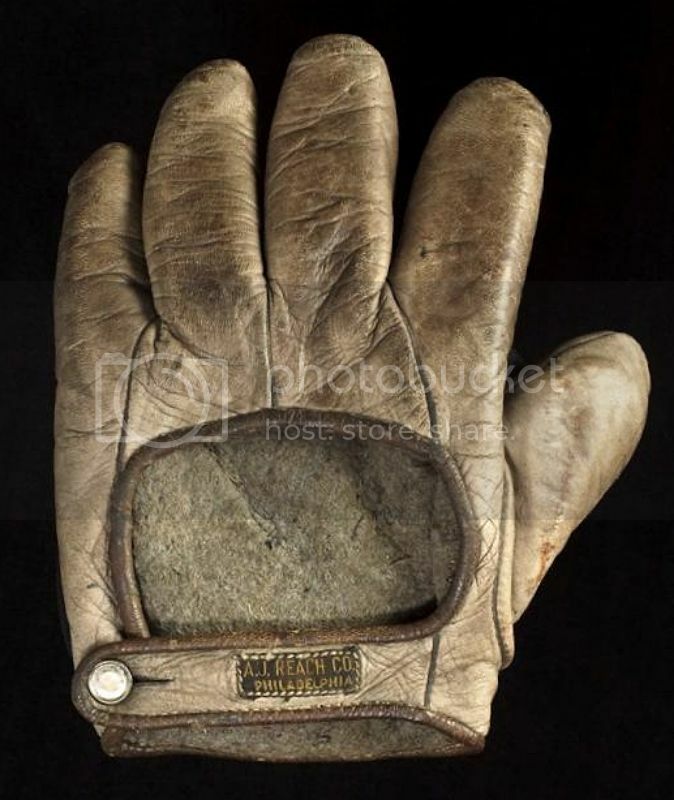 The Bing Miller glove you have looks to be from late 1940's or early 1950's, most likely after his career had ended. 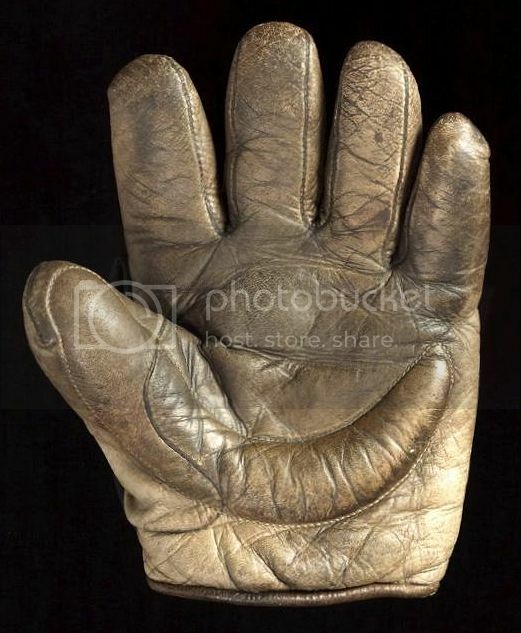 There is at least one other Bing Miller glove that it is a little earlier than you. The other one, and yours, are both Canadian issued. Maybe he had an endorsement deal with Reach in Canada? vintagebrett wrote: Welcome and thanks for the pictures. 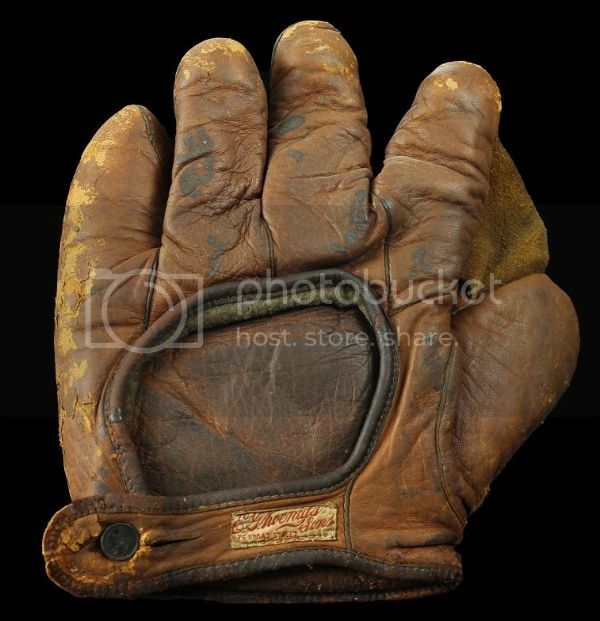 The Bing Miller glove you have looks to be from late 1940's or early 1950's, most likely after his career had ended. There is at least one other Bing Miller glove that it is a little earlier than you. The other one, and yours, are both Canadian issued. Maybe he had an endorsement deal with Reach in Canada? I see that now. The gloves posted above, while very similar, have a patent # on them. There goes my $10,000 US starting price. Well, at the very least it will be a very cool ornament. I live by myself and I have an empty dining room in my apartment. I'm going to put a pool table in there (I'm not joking). I'll hang it on the wall or something. Thanks Brett. You have been very helpful. The old Reach factory on Tulip St. 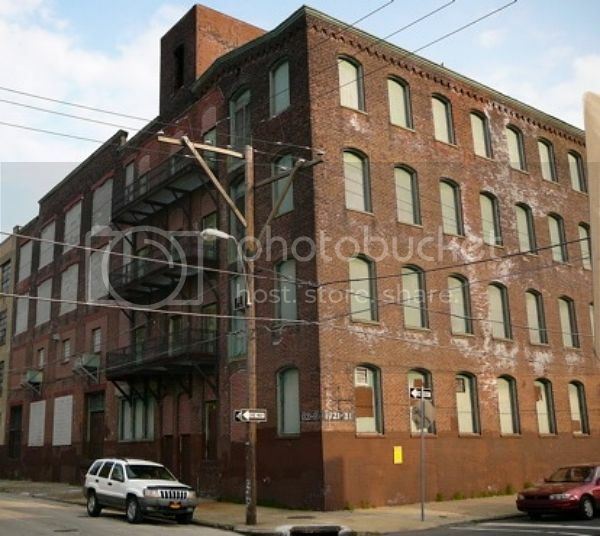 The renovated factory building, now condos, dubbed the "Reach Lofts"
Nice crib! Fishtown going upscale!